P&E Hydrogen Separator - HS INC.
Power+Energy Hydrogen Separators produce ultra-high purity hydrogen from hydrogen rich gas streams for Fuel Cells. Each H2 separator may be custom designed to match the specific conditions of the customer’s application. Power+Energy manufactures H2 separators ranging in hydrogen output from 0.5 slpm, capable of feeding a 50W fuel cell, up to 1,200 slpm, capable of feeding a 120kW fuel cell. Our Separator technology is often used to extract the hydrogen from reformate streams generated by steam or auto-thermal reformers. In other cases P+E Separators extract H2 from a process by-product stream, from bio-gas (digesters, etc.) or from closed-circuit H2 recirculation systems. 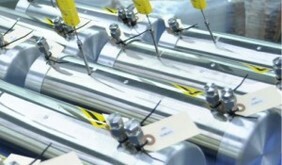 Power+Energy Hydrogen Separators use Micro-Channel Palladium Alloy Membranes to extract hydrogen from the feed stream. For mixed gas streams containing sulfur compounds, a sulfur-tolerant palladium alloy is used. In some applications, customers use a sweep gas, either nitrogen or steam, to boost the hydrogen recovery of the H2 separator. Membranes should not be exposed to H2 when below 300 °C to avoid embrittlement. It is recommended that a backpressure regulator is installed in the raffinate line. Preheat membranes with steam, hot air or hot inert gas prior to flow of H2 or reformate. Purge membranes with steam or inert gas prior to allowing membranes to cool below 300°C. It is recommended to monitor the raffinate outlet gas temperature in order to ensure that the membrane temperature remains above 300 C while h2 containing gases are flowing through the separator. Caution: It is essential that catalyst particles from the reformer are prevented from entering the hydrogen separator. The Power+Energy HEMS™ series of Hydrogen Purity Analyzers are full spectrum instruments with limits of detection per impurity of < 1 ppt*. The analyzer is self-calibrating and, with a short analytical cycle time, can be used as an on-line impurity monitor. The compact package and automatic operation make it easy to use for quick sample verification at multiple points. 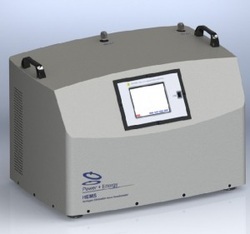 The HEMS (hydrogen elimination mass spectrometer) analyzer uses P+E’s patented palladium diffusion technology combined with advanced quadrupole mass spectrometry to achieve parts-per-trillion resolution.